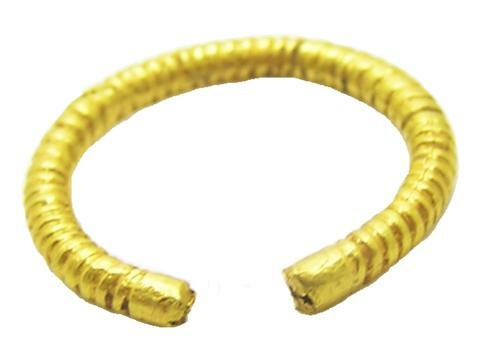 This is an Iron Age (Celtic) gold plated finger ring, dating to the 5th - 3rd century B.C. The hoop of the ring is made from a bronze core, decorated with a wrapped gold foil. The decoration in the form of grooved 'twisted', bar-twisted effect. Chunkier penannular gold plated ring are known from the Bronze Age, used for a variety of decoration as 'hair-rings', 'beard-rings' and like this example 'finger rings' (see 'Penannular Rings' SF7547 & 1965,0606.1 for further discussion). This example has survived in excellent condition, only a tiny piece of the gold foil is missing by the terminal exposing the bronze core. DATE: c. 5th - 3rd century B.C. PROVENANCE: Ex. European private collection, Germany.